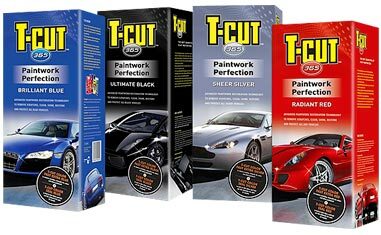 T-Cut have developed a special blend of exclusive products formulated to remove scratches and turn a dirty, dusty vehicle back to its original form when it was brand new. T-Cut 365 Ultimate will bring the shine back to the vehicles paintwork, whilst also polishing and sealing the surface, keeping your car looking brand new for up to 12 months! Kit contains: T-Cut Color Fast, T-Cut Color Seal, Microfibre Applicator pad & Microfibre Cloth. This entry was posted in Uncategorized and tagged colour fast, kits, t-cut, tcut. Bookmark the permalink. Want to restore your car’s paintwork?